Hiker hunger is legendary. After all, eating is one of the primary pleasures and legitimate needs of a person taking a 2,200-mile walk. As a rule, you can expect to burn at least twice as many daily calories on trail as you might in your regular life. How inconvenient that this happens right when you are required to carry those calories—3-5 days’ worth—everywhere you go! It must be this paradox that turns hikers savage when they hit the all-you-can eat buffets in trail towns. It’s almost guaranteed that for 3-5 days’ walking, if you have to carry everything you’re going to eat, you’re going to run a calorie deficit. Until you hit a town, that is. Then all bets are off—or so I’ve read. There was the woman who ate a box of Cheerios and half a gallon of milk sitting on a curb in a grocery store parking lot. There are the countless thru-hikers who attempt (and often meet) the half-gallon ice cream challenge at Pine Grove Furnace State Park, Pennsylvania. I read about one hiker who quite comfortably polished off two appetizers, two entrees, four beers, and one dessert in a restaurant before stopping off for—and finishing—a pint of Ben and Jerry’s on her way back to the hostel. We’re talking Michael Phelps-grade meals and appetite here, people. As someone who loves food as much as the next person (okay—it’s probably more; no, it’s definitely more), naturally I’m excited about getting a license to go crazy with calories. But as a woman who’s noticed that women don’t waste away on the trail the way men do, I’m concerned. And it’s not primarily the weight aspect that worries me. What worries me is nutrition. Maybe 26-year-old men can get away with eating exclusively burgers, ramen, peanut butter, pizza, beer, and ice cream while punishing their bodies all day long, but I’m more than a little skeptical that at 43, I can, too. And yet peanut butter and ramen are some of the most calorically dense and therefore efficient foods to take on a long-distance hike. And I’m just as likely as a 26-year-old man when I get into a town to crave high-fat, high-carb, high-sugar food. And there is no doubt my body will want with heroic desire the mellowing, carby pain-relief of a hoppy IPA or three. So what to do? I want to finish the journey in AT LEAST as healthy a shape as when I started—but more importantly, I want to fuel my body for the best possible performance and happiest days walking. Junk food is as ubiquitous in trail towns as it is cheap, so that will clearly be a very tough option to avoid. But junk food is still junk food, no matter how many calories you’ve burned to “earn it” and no matter how badly you crave it. 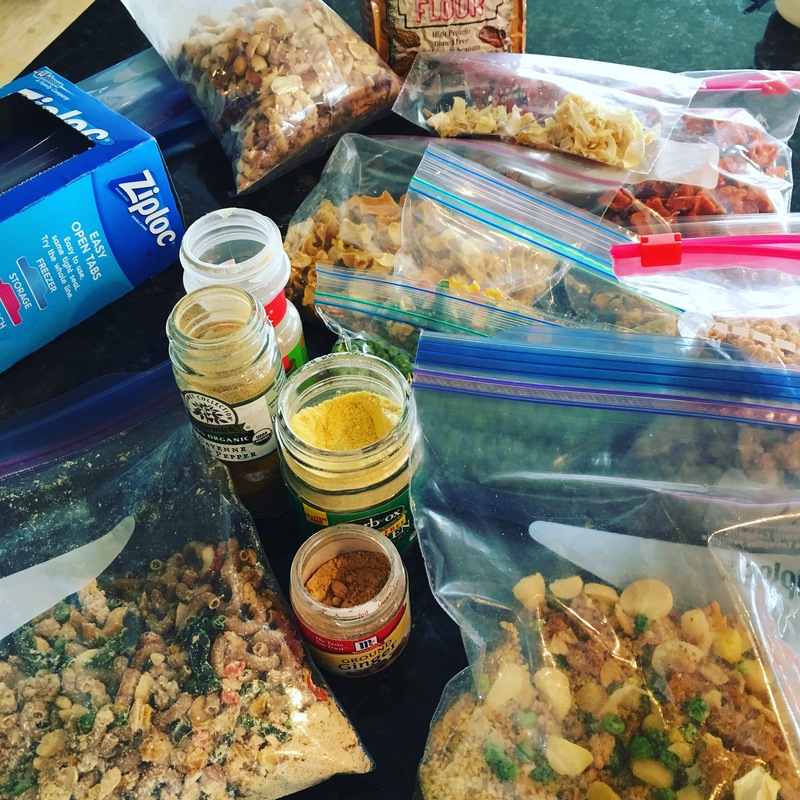 So, after three weeks on a healthy eating program, on the advice of some thru-hike veterans, and after a little research, I’ve come up with a plan. First is that I’m making ample use of mail drops. I realize this will be an inconvenience (timing, planning). Anti-mail-drop thru-hikers abound on the Interwebs, and their principal arguments seems twofold: (1) you cannot predict what you’ll want to eat since you’ve never subjected your body to this kind of rigorous endurance activity, and (2) you can get in the trail town grocery stores, hostels, resupply points, and gas stations pretty much anything you’d be shipping yourself. I can’t argue with the first idea, but I definitely disagree with the second. I’ve been in trailside gas stations, and I’ve seen pictures of hostel resupply shelves. So that argument works only for someone happy to subsist on Pop Tarts, Cup O’ Noodle, peanut butter, Clif Bars, and Slim Jims. Of course I won’t be shipping those items to myself. 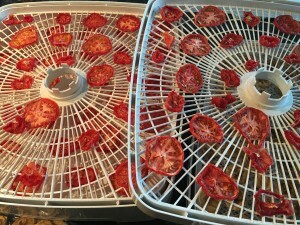 Instead, I’m dehydrating meat, veggies, and fruit, and putting together homemade backpacking meals. 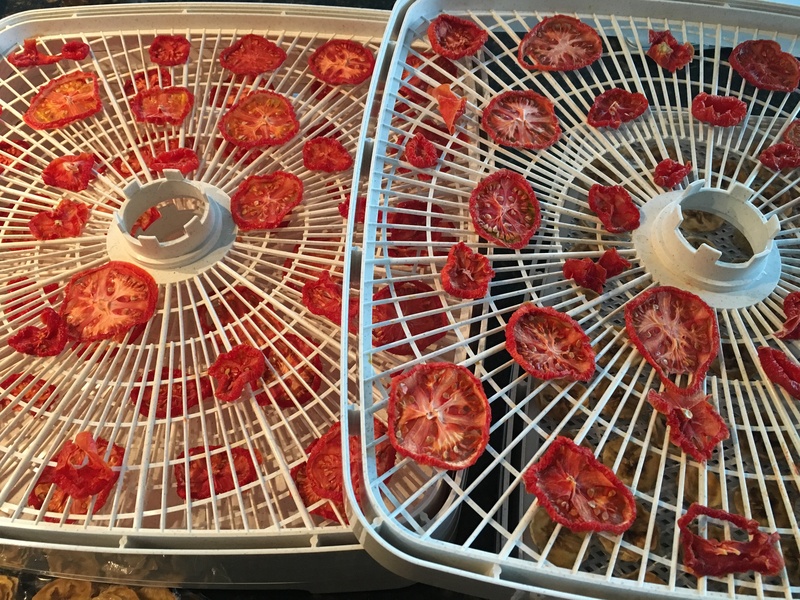 It is a lot of work, and it is time consuming, and I don’t really know whether I’ll wind up liking any of it, or whether there are enough hours left to run the dehydrator as much as I need to, but I really, really want to eat healthfully on this hike. I cored, sliced, treated with lemon juice, and dried a lot of apples and pears (but didn’t peel them—I want the fiber). I peeled, sliced, treated, and dried a bunch of bananas; cooked and dehydrated about four pounds of ground turkey and chicken; sliced and dehydrated onion, garlic, tomato, pumpkin, sweet potato, butternut squash, cauliflower, carrot, and frozen peas, corn, and mixed-bag veggies (it’s nowhere near enough, I realize; I’m plugging along, a little bit each weekend). I researched dehydrated backpacking meals online and found this web site, with six dinner recipes and a bunch of fun instant oatmeal varieties. I’m also planning to take a daily fish oil supplement, a probiotic, and a mulitvitamin, and I’ve just bought some green powder superfood package that I haven’t yet tried but which looks promising as a method to stir more fiber and nutrients into my meals. The only really unhealthy parts of the day are lunch and the summer sausage—I tried to find some healthy ramen, but short of making my own or spending a lot on vegan options (which would not have enough calories), I think I’m stuck with the bad-for-you stuff. Given that the rest of the food is pretty wholesome, I’m going to have to be okay with that. Those will be my trail days between mail-drop towns. When I get into towns, I fully expect to indulge in beer, pizza, and burgers with everyone else—I just want to make certain to also stuff my face with fresh fruit and veggies. Instead of a box of Cheerios with milk, my grocery-store curbside meal might be a cucumber or two, eight apples, and a bag of baby spinach. The third type of eating I’m planning for is trail days between resupply towns—places with true grocery stores or real variety in the hostel supply-shelf offerings. I plan to buy some fresh fruit and veggies for the first day, cheese, peanut butter, tortillas (whole wheat if I can find them), jerky, tuna or chicken pouches, energy bars, and trail mix. I plan to avoid Pop Tarts and Little Debbie Snack Cakes—wish me luck on that last one! I know there’s no way to know what I will want to eat or how much I will really need, so I fully expect to depart (probably even radically) from this plan. I’m sure as hell not going to turn down trail-magic Snickers, Cokes, or hot dogs, for example. But, to paraphrase Dwight Eisenhower, although plans are worthless, planning is invaluable. At least for now, I have a plan. I always say you got to have a plan! Sounds like you do. Hiking makes you really hungry and I think you will burn more calories than 3000. Be sure to eat enough fat and carbs. My husband tried to eat healthy but his body statarted to urinate blood by the time he got to the Smokies. His muscle just left his body! We adjusted his food to take in some fatty calories and he did much better after that. Best of luck to you lady. I will be following along with you! Thanks for the advice–yes, since posting this I’ve heard from several folks that 3,000 is too low an estimate. Working on revising what I plan to take on that basis. It’s hard to carry that much, yikes! Sarah said it (below), and yes, NoBo is northbound, so that means I’m starting in Georgia. Thanks for reading, and thanks for the encouragement. Glad you are planning to get out there!